"A nice light appetizer. Delicate rice wrappers are filled with noodles, shrimp, carrots, lettuce and basil. Cooked chicken or beef may be substituted for shrimp." Bring a medium saucepan of water to boil. Remove from heat. Place rice vermicelli in boiling water, remove from heat, and let soak 3 to 5 minutes, until soft. Drain, and rinse with cold water. Fill a large bowl with hot water. Dip one rice wrapper in the hot water for 1 second to soften. 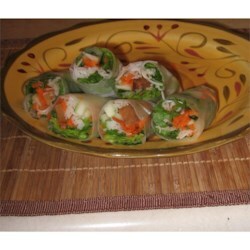 Lay wrapper flat, and place desired amounts of noodles, shrimp, carrot, lettuce and basil in the center. Roll the edges of the wrapper slightly inward. Beginning at the bottom edge of wrapper, tightly wrap the ingredients. Repeat with remaining ingredients. In a small bowl, mix the hoisin sauce with water until desired consistency has been attained. Heat the mixture for a few seconds in the microwave. Serve the spring rolls with the warm dipping sauce. These were good but missing something. I will try adding more basil or mint maybe next time. I think the peanut sauce would also complement these well. These were a very refreshing appetizer. They are kind of time consuming to make but a wonderful for a light dish. I recommend serving them with Mae Ploy sweet chili sauce. I like these a lot. Instead of the dipping sauce from hoisin, I like to dip them in Thai sweet chili sauce. It's light and tastes great! !